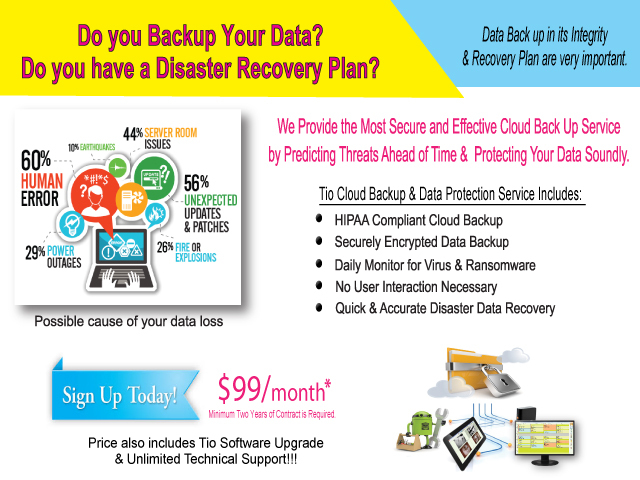 Total Digital Solution Provider from Front to Operatory. The Total Solution Mobile includes Tio Practice Management Software to handle front office responsibilities and an Intraoral Camera & Digital X-Ray System for imaging in the operatories. 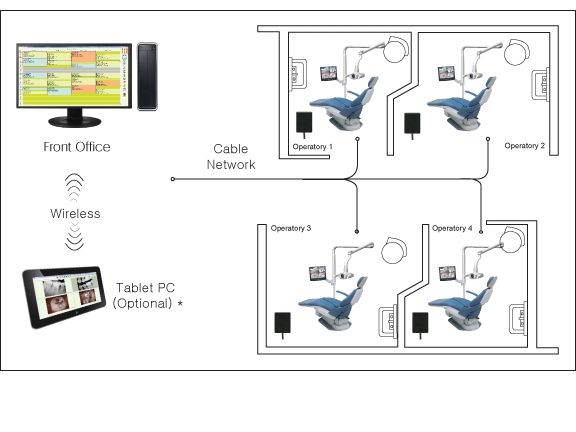 Exchange information from the operatory to the front office in real time with the innovative wireless network. Utilizeclinical charting and take and view intraoral or digital x-ray images and then send them to the front office where they can be used for electronic claims and treatment planning. Accessing the appointment scheduler, insurance status, and treatment history from the operatory supplies patients and dentists with quick, comprehensive service. The Total Solution Mobile is the best way to create a near paperless office. Capable of servicing your entire practice, the Intraoral Camera & Digital X-Ray System comes packaged with an attractively designed, space saving mobile cart for easy transportation, allowing you to transfer the unit freely without the need to have computers in eachoperatory. The Total Solution, Chairside is the answer for an all in one digital package that doesn't require anyparts or equipment to be moved around. 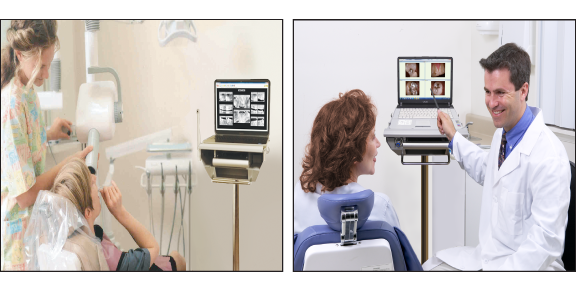 It comes with Tio Practice Management Software to handle front office responsibilities, chairside pole-mounted All-in-One Computers on each operatory for betterpatient communication, and USB direct connected Digital X-Ray Sensor and LED Intraoral Camera for image capturing in the operatories. And the Tablet PC works as a handheld viewing station for absolute mobility. Components of Total Solution, Chairside integrate and are connected by a network, allowing you to exchange information with the front office and operatories in real time. Total Solution, Chairside fulfills the needs of multiple operatories without the hassle of moving computers or carts from operatory to operatory. 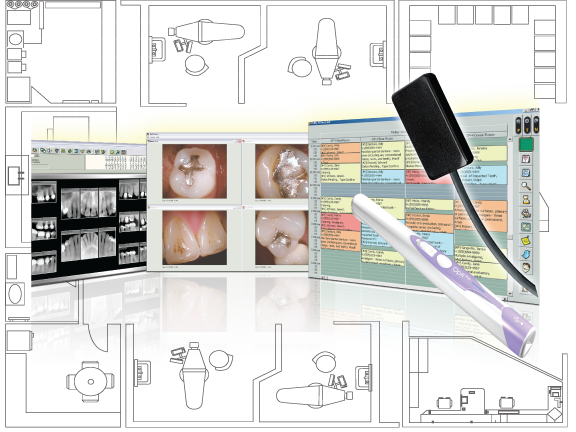 Each operatory comes equipped with a All-in-One computer, and USBdirect connected Digital Sensor and LED intraoral, completing a digitally integrated imaging station capable of communicating with the front office through a network. Utilize clinical and perio charting, paperlessFile Cabinet , and both digital intraoral and digital x-rays, you can build a paperless office. 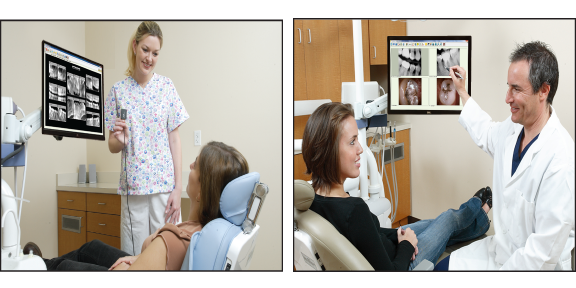 The tablet PC gives you instant, portable access to intraoral images, x-ray images, and allows you to participate in clinical and perio charting anywhere in the office. Access or input important information while on the go and maximize the wireless technology that comes with Total Solution, Chairside to almost entirely eliminate the need for paper. The Total Solution, Signature is the solution withour latest technology product, Explorer HD Lite, "A complete operating light & video camera system". Your office will be fully equipped with all-in-one digital package, it comes with Tio Practice Management Software to handle front office responsibilities, chairside pole-mounted All-in-One computers on each operatory for better patient communication, and USB direct connected Digital X-Ray Sensor and Magnifying Video Scope for live streaming video recording and image capturing in the operatories. And the Tablet PC works as a handheld viewing station for absolute mobility. Components of Total Solution, Signature integrate and are connected by a network, allowing you to exchange information with the front office and operatories in real time. Total Digital Solution with All-in-One "Operating Light & Video Camera System"
Total Solution, Signature fulfills the needs of multiple operatories without the hassle of moving computers or carts from operatory to operatory. 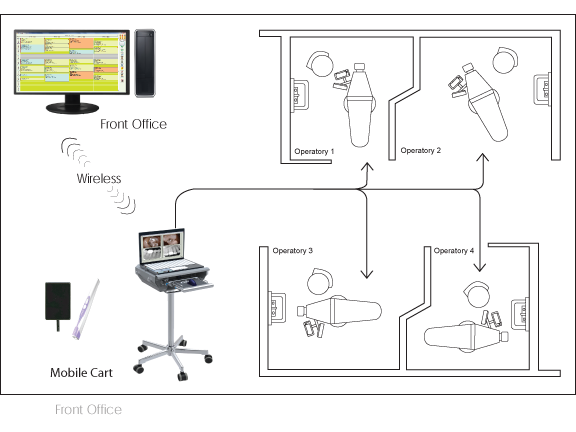 Each operatory comes equipped with a USB direct connected Digital X-Ray Sensor and Explorer HD Lite System, completing a digitally integrated imaging station capable of communicating with the front office through a network. Utilize clinical and perio charting, paperless File Cabinet,and digital x-rays, you can build a complete paperless office.